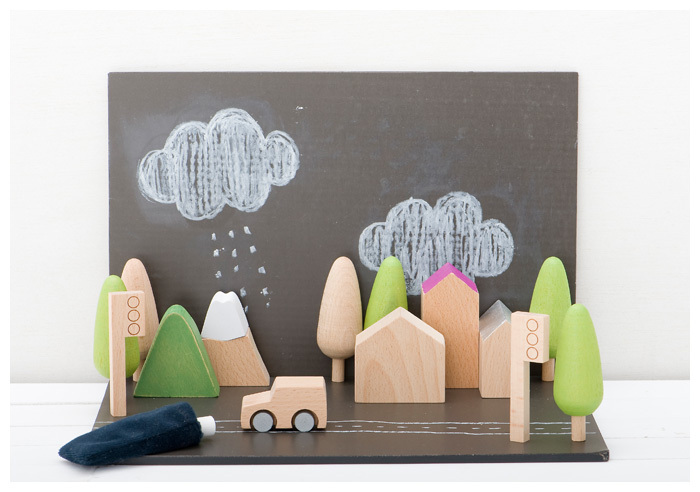 These wood and chalk cityscapes from Kiko+ are the perfect inspiration for your littlest world travelers and urban planners. The Japanese designed chalk and wood cityscapes are a wonderful way to instill a love of learning, travel and city design in your kids. Little ones can use the chalk to draw roads and signs and organize the buildings and landmarks throughout the cityscape. Choose from the standard set, Paris or London. I have recently discovered this beautiful Japanese brand and am in love with all of their wooden toys. How cute are these wooden bubble wands? I can’t imagine any kids who wouldn’t be excited to play with such lovely, creative toys. The cityscapes would certainly be a great addition to any child’s play room, and would encourage kids to design their own city and learn about important monuments like Big Ben and the Eiffel Tower along the way!